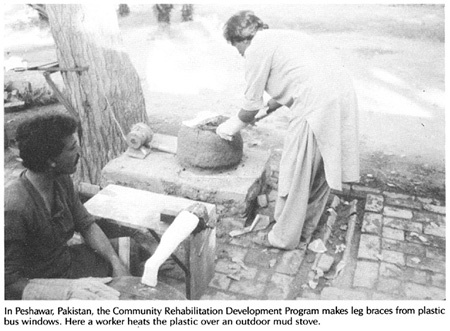 In PART 2 of this book we talked about the value of village-based rehabilitation centers run by local disabled village workers. One important feature of such a center is a simple but adequately equipped shop for making basic orthopedic equipment and rehabilitation aids at low cost. The shop also gives disabled persons a chance to learn useful skills, to earn some money, and to be good examples for other disabled children and their families. There is no formula for how big the shop should be or what it should include. Often it is best to start small but to leave room for growth. game and toy making(or this can be done in a separate 'children's workshop'. See Chapter 49). The skills and tools for welding, woodworking, sewing, and leatherworking can also be used to make things other than those needed for rehabilitation. The village shop and its workers can make things that can be sold to help pay for program costs. For example, disabled workers in the shop of PROJIMO in Mexico make metal framed chairs with woven plastic seats, sandals with auto tire soles, and silk-screened goods such as bags, T- shirts, and aprons. The shop also provides welding or repair services for plows, bicycles, machinery, shoes, and many other things. Selling these things and asking small charges for repair services brings in some money to the program, helping it toward self-sufficiency. It also provides training and work experience for disabled workers who may later choose to work independently. However, caution must be taken not to try to do too many things in one workshop - especially if space is limited. It can easily become too disorganized. You may have to start with whatever space or building you can find. If you have enough funding or community cooperation (or both) you may be able to build a shop. However, it is often best to start in some old rented or borrowed building, and not build your own shop until you have experience and a better idea of just what you need. Try to put the shop close enough to the rest of the rehabilitation center for convenience, yet far enough away so that shop noise does not disturb discussions and therapy with children and their families. In hot climates especially, make sure the shop is well ventilated (allows air movement). A roof with one or more walls that are open, except for bars or fencing, works well. Be sure there is plenty of storage space. This is especially important if old braces, wheelchairs, bicycles, and other used equipment are collected for used parts, to save money. The PROJIMO workshop first opened on the back porch of an old house. A year later a new shop was designed and built with community participation, and some outside funding. It is 8 × 12 meters. Two walls are screened, on the sides the rain is least likely to blow in. A large loft provides storage space and helps to keep the work area below cooler. The new shop is already too small! Enough space should be allowed everywhere for 2 wheelchairs to pass each other. At least some of the workbenches should be low enough to work at from a wheelchair or stool. Build them so that wheelchairs can get close to or under them with as few obstacles as possible. Tools and supplies should be stored within easy reach of workers in wheelchairs. Also, switches and power outlets. 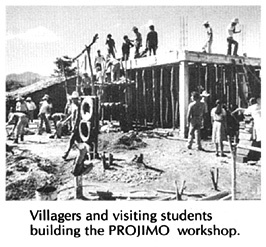 The drawing on Page 535 shows how the workshop of PROJIMO is arranged. We include it as an example, not as a model. What is needed will depend on what activities the shop includes, how simple or complex is the technology used for each activity, and whether or not electric power and tools are available. Nearly all aids can be made of local materials with hand tools, and without electricity. Even wheelchairs, if made of wood, can be built with few tools or equipment. The small amount of welding required for axles could perhaps be done by the nearest welding or auto repair shop. However, having a few time - and effort-saving tools con make work easier, faster, and more enjoyable: a sewing machine, a grinding wheel (whether hand crank or electric), and a gas or electric stove (to heat plastic for braces). Welding equipment or a blacksmith's forge and bellows makes possible the production of many things. 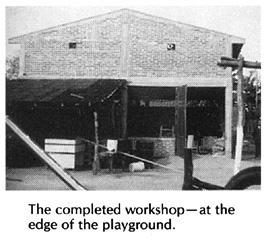 Basic tools and equipment for the shop will be discussed in more detail in this section of the book, PART 3, the chapters of which describe making different kinds of aids. One very expensive but important piece of equipment is an electric cast cutter. It is an extremely useful tool for removing plaster casts and for cutting molded plastic braces from plaster forms. It is also a relatively safe tool, because the blade vibrates but does not turn, so it cuts hard things like plaster more easily than soft things like skin and flesh. Possible ways for learning different shop skills were discussed in Chapter 54. Here we will only repeat that one of the best ways to learn shop skills is through 'apprenticeship', or learning-by- doing under the guidance of someone with more experience. Perhaps local craftspersons, such as carpenters, welders, and shoemakers would be willing to help teach members of the team. If the team has one or two persons with basic crafts experience, they can teach the others. For brace and limb making, it may help if one of the rehabilitation team has a chance to visit and learn in an orthotics and prosthetics shop. Or perhaps a skilled brace or limb maker can come for a few weeks to help set up shop, obtain basic materials, and teach the local team. With an active, learning-by-doing approach, together with hard work to meet daily needs, team members can quickly become relatively skillful. On the other hand, if the team is made up, at least in part, of young disabled persons who have never worked before or cooperated as members of a team, both learning and work may at first progress more slowly. How work is organized in the shop, and who organizes it, are decisions that need to be carefully discussed and decided by the group. Some programs have someone acting as 'boss' or 'foreman' who assigns each person a job. This may be more efficient. But programs that are 'people centered' prefer a more cooperative approach, where the whole group is involved in making key decisions. With such an approach, a coordinator may be chosen (or different coordinators can be chosen for different responsibilities). The coordinator does not give orders, but rather takes orders from the group. This approach is usually less efficient and more confusing. However, it is more enjoyable. Workers tend to take more interest, responsibility, initiative (and time off) than they do under a boss. Also, the team needs to decide about how work is divided, and who does what jobs. Some workshops employing disabled persons use an 'assembly line' approach. Each person does a simple, repetitive job, such as cutting out one piece of tubing time after time or putting spokes into wheels. This approach requires relatively little training for each worker. Mentally retarded workers who learn by repeating something over and over again often do well working this way. However, most people work better when they are able to make something from beginning to end. Then they can share the satisfaction of a child and her family when a wheelchair or brace or toy they made looks nice and works well. In PROJIMO, whenever possible, workers (individually or in pairs) are responsible for the complete production of an aid. They start by helping to evaluate the child's needs and end by seeing how well the finished aid meets those needs. This way, each worker can see the personal value of each aid that he or she makes. This approach may be less efficient, but it is more satisfying. Thus the team watches the results rather than the clock, and works first for the people, not the money. This personalized approach is very important to a program designed to serve those in greatest need. 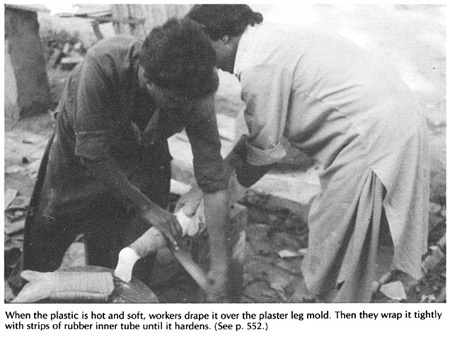 PART 3 of this book provides information on two main areas: (1) non-surgical orthopedic procedures (straightening contractures and club feet with casts), and (2) the production of low-cost rehabilitation aids. All of these things can be done in a village-based workshop such as the one just described. However, many of the aids can also easily be made at home by the family of the child. To encourage family participation in making aids, and later repairing them, mothers, fathers, sisters, or brothers can be invited to the shop to help build the aid. Or disabled children can help make their own aids. 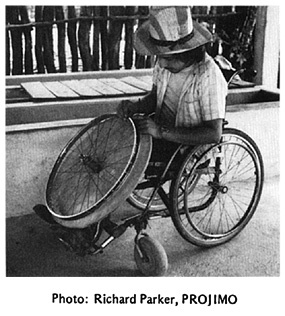 Some of the best workers in the PROJIMO workshop today began as young people who helped make their own crutches or wheelchairs - and then began to help make aids for others. The ideal is that everyone does what they can to help and learn from each other: one big, human family working together and enjoying each other.